The Jackson AJX-54 high temperature conveyor dishmachine can clean up to 225 racks per hour! With 25" of clearance, it's able to accommodate oversize sheet pans, mixing bowls, and other large kitchen items. 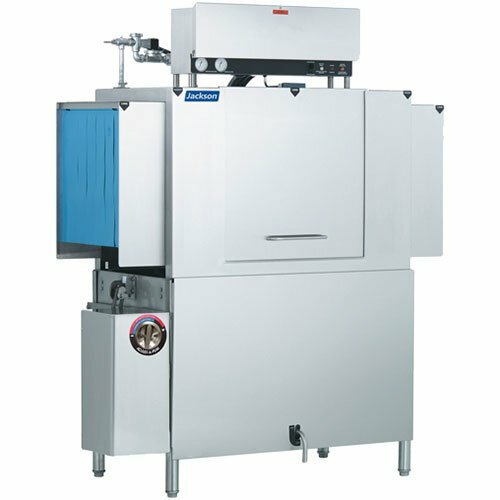 A full 18" of clearance between the wash and rinse cycles reduces splashover of wash water onto rinsed dishware, and an 18 kW wash tank heater helps maintain proper water temperatures. The Jackson AJX-54 conveyor dish machine features manifold-style wash arms that are easy to remove and provide superior wash action. Its exclusive "Energy Guard" system operates the machine only when a rack is being washed or rinsed, saving water and energy. A quiet, self-draining stainless steel wash pump delivers maximum performance, while keeping noise to a minimum. Other useful features include easy-to-use electromechanical controls, adjustable conveyor speed, durable stainless steel scrap baskets, and fully automatic operation, including auto-fill. It requires a 230V, 3 phase electrical connection.